Looking for unique garden ideas? Did you know you can grow your own sweet potato vine? You just have to grow a slip off of an organic potato that you already have! How cool is that? They make for some wonderful fresh garden produce! We live in Utah and my husband is a big sweet potato fan, so we grow them. Last year when we were at the nursery getting a few starter plants, he asked about sweet potato starters. Since we weren’t able to get sweet potato slips from the nursery last year, we had to make another plan. You can order sweet potato slips from catalogs or online…or you can grow your own. Last year he ordered some, but this year growing sweet potato slips has been a fun little project for us. 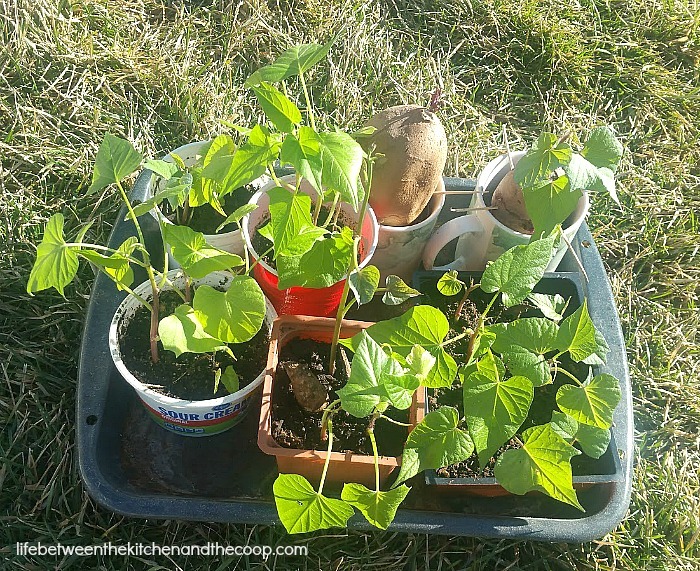 Growing sweet potato slips is fairly easy to do. Once you plant your slips you can just grow them indoors until it gets really warm outside. Sweet potato vines grow best in a warm climate (warmth is very important! ), with some sun and some shade. Once it is nice and warm, you can transplant the sweet potato vines in your garden. One of my college roommates, who is an amazing gardener, tried growing them in the Portland area and it was just too wet. However, if you live somewhere that is nice and warm, you’re golden! If you want to try growing your own sweet potato slips, I can help you! Let me show you how it is done! Start with an organic sweet potato. Yep, from the grocery store. Make sure it is organic, though. Avoid genetically modified sweet potatoes. They may not work because they aren’t designed to reproduce. Smaller-sized (a couple of inches in diameter) organic sweet potatoes work better for growing slips than large ones. Submerge half of the organic sweet potato in a cup of water, using toothpicks to hold it in place. The other half of the sweet potato should be sticking out in the open air. Let your slips grow in a warm place, like near a window where there is good sunlight or near a radiator that is in use. 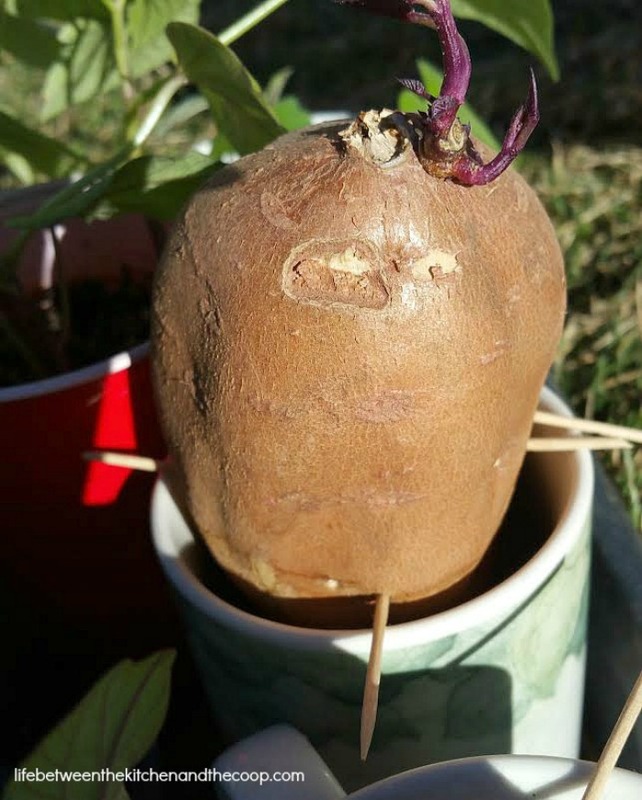 You see those little purple sprouts coming out of the sweet potato? Those will be the slips (they are purple because we grew purple sweet potatoes). Remember: Unless you live somewhere that is warm all year round, grow them in indoor containers until after last frost and you are sure it will stay plenty warm outside. 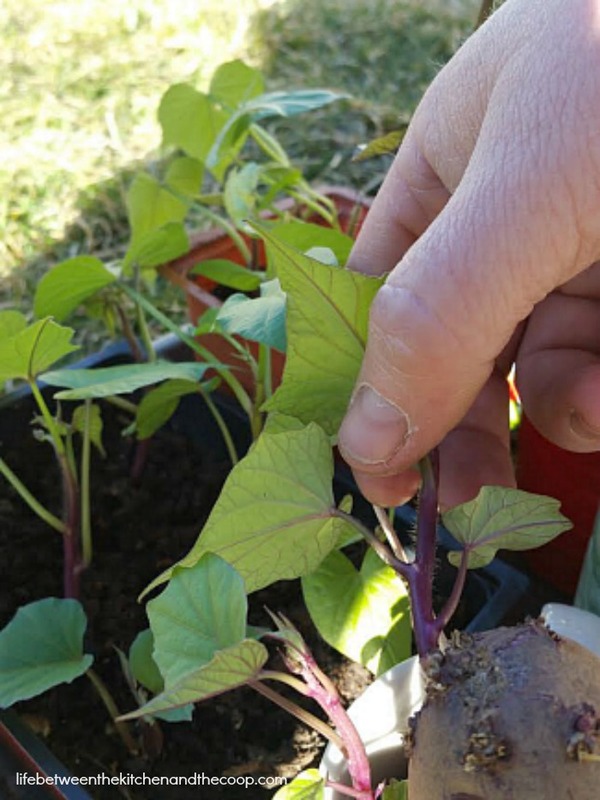 When the sprouts are have four or five leaves, separate them into slips that you can plant (that’s what my husband is doing in the picture below-pulling the purple sprout off of the sweet potato). When the time comes to transplant them, the soil will need to be well-drained and loose. Loosen the soil about 5 inches deep and a few inches around where you are planting the slips. It is important that there is not significant resistance in the soil or they won’t grow well. That’s it! Easy as that! 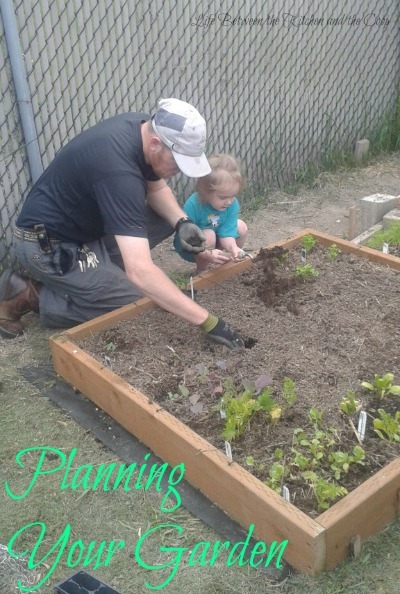 Be sure to follow my gardening board on Pinterest! Next story Funtastic Friday 117 Link Party! Thank you for featuring my What Glass Paint to use when Painting on Glass tutorial! Thanks for the party too! Sure! Thanks for joining in!